AMMAN, Jordan - Secretary of State John Kerry said Sunday that a "provisional agreement" has been reached on a Syrian cease-fire that could begin in the next few days, but he acknowledged that it's not finalized and all parties might not automatically comply. Explosions meanwhile ripped through the central Syrian city of Homs and a Damascus suburb, killing nearly 100 people, and government forces backed by Russian warplanes pressed a major offensive north of Aleppo that has undermined previous efforts to halt the fighting. Kerry said he discussed the terms of a cease-fire with Russian Foreign Minister Sergey Lavrov and said the two must now reach out to the opposing forces in the five-year-old Syrian conflict. He declined to go into the details of the agreement, saying it "is not yet done." 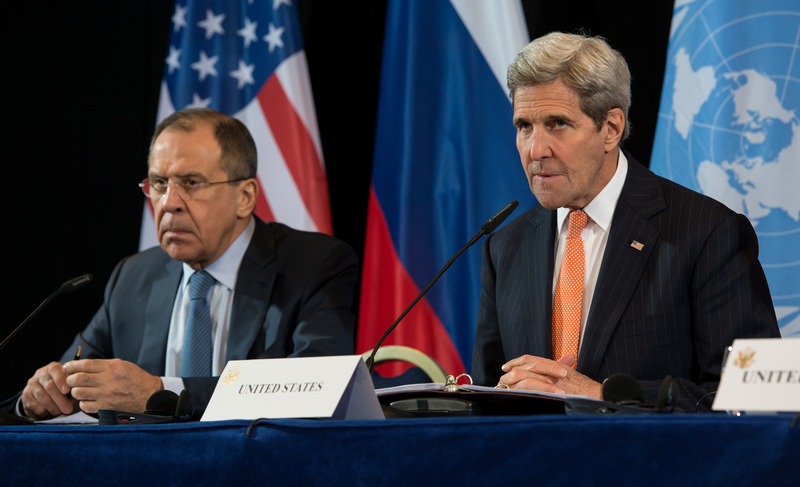 "The modalities for a cessation of hostilities are now being completed," Kerry said. "A cessation of hostilities ... is possible over the course of these next hours." He said he hoped U.S. President Barack Obama and Russian President Vladimir Putin would talk soon and that implementation could then begin. The Russian Foreign Ministry said Lavrov and Kerry spoke on the phone Sunday for a second day in a row and discussed "the modality and conditions" for a cease-fire that would exclude groups that the U.N. Security Council considers terrorist organizations. Syrian President Bashar Assad said in remarks published Sunday that his government was ready to take part in a truce as long as it is not used by militants to reinforce their positions. "We announced that we're ready," Assad told Spain's El Pais newspaper. "It's about preventing other countries, especially Turkey, from sending more recruits, more terrorists, more armaments, or any kind of logistical support to those terrorists," Assad said in English in the interview, which was also carried by state news agency SANA. Assad's government refers to all the armed groups battling to overthrow him as terrorists. Turkey and Saudi Arabia are among the leading supporters of the insurgents. Assad's forces have almost completely surrounded the northern city of Aleppo. He said the immediate aim is not "recapturing the city," but "closing the roads between Turkey and between the terrorist groups." The United States, Russia and other world powers agreed Feb. 12 on a deal calling for the ceasing of hostilities within a week, the delivery of urgently needed aid to besieged areas of Syria and a return to peace talks in Geneva. Aid shipments were allowed into several besieged areas last week, but the deadline for the cease-fire passed with no letup in the fighting. German Foreign Minister Frank-Walter Steinmeier said he welcomed the latest agreement and said regional powers should exert their "influence on the warring parties in Syria to use the window of opportunity that now exists." The explosions in Homs on Sunday killed at least 46 people and wounded dozens, according to Syria's Foreign Ministry. The Britain-based Syrian Observatory for Human Rights, which relies on a network of activists around Syria, said 57 people, including 11 women, were killed in the Homs blasts, adding that they were caused by a pair of car bombs. Bomb blasts also ripped through Sayyida Zeinab, a Shiite suburb of Damascus, according to Syrian state TV, which said 50 people were killed and more than 200 wounded. The neighborhood is home to one of Shiite Islam's holiest shrines, which was not damaged. The Islamic State of Iraq and Syria (ISIS) claimed both bombings. Most of the bombing attacks in Homs over the past months have been claimed by ISIS, which controls parts of the surrounding province, including the historic town of Palmyra. Syrian TV aired footage of the destruction in Homs. Debris and mangled cars filled the streets, and the charred body of a man was seen being taken away on a stretcher. The Observatory said that angry residents forced Governor Talal Barrazi and Interior Minister Mohammed al-Shaar away from the scene of the blasts when they visited the area. The report could not be independently confirmed. The Zahra neighborhood, where the attacks took place, is predominantly Alawite, the minority Shiite sect to which Assad belongs. Homs, once dubbed the capital of the Syrian revolution, has been hit with a wave of attacks in recent months, killing and wounding scores of people. The rebels controlled large parts of Homs after the uprising against Assad's government began in March 2011. With time, the government gained control of most of the city, and a deal was reached late last year for militants to evacuate the last rebel-held neighborhood of Waer. To the north, the Syrian army captured 31 villages on Sunday that were controlled by ISIS, according to the pro-Syrian Lebanon-based Al-Mayadeen TV and Hezbollah's Al-Manar station. Al-Mayadeen and Al-Manar often have reporters embedded with Syrian troops in northern Syria. Syrian state media earlier reported that Syrian troops had captured some 10 villages in Aleppo province from ISIS. © 2016 The Associated Press. All Rights Reserved. This material may not be published, broadcast, rewritten, or redistributed. With student loan debt soaring to $1.57 trillion last year, Jill Schlesinger warns: "Don't sign on the dotted line without doing homework"
State senator receives 1,700 decks of cards after saying nurses "play cards"
Evangelist Billy Graham's son, a supporter of President Trump, tweeted that the Bible "defines homosexuality as a sin, something to be repentant of"
Catherine Pugh, the mayor of Baltimore, is under investigation as she faces scrutiny over book deals. The FBI has confirmed it is working with the IRS. CBS News chief justice and homeland security correspondent Jeff Pegues discusses what we know. An American tourist who was kidnapped in Uganda’s Queen Elizabeth National Park three weeks ago is opening up about the harrowing ordeal for the first time. Kimberly Endicott was held for almost five days then released after a ransom was paid. Many of the details are still a mystery. “CBS This Morning” co-host Gayle King spoke with Endicott in California about what happened. In his final "Riverdale" scene, Luke Perry's "Fred Andrews" had a heart-to-heart with his son, Archie, played by K.J. Apa. Rep. Tom Malinowski is weighing in on the 2020 presidential race and the Mueller report. The New Jersey Democrat explains to CBSN why he's supporting Sen. Cory Booker and why he's "not there yet" when it comes to impeachment proceedings against President Trump. Russian President Vladimir Putin says North Korea's Kim Jong Un is ready to give up his nuclear weapons but he wants security assurances. The two leaders met for a historic summit in Russia. CBS News foreign correspondent Charlie D'Agata reports.